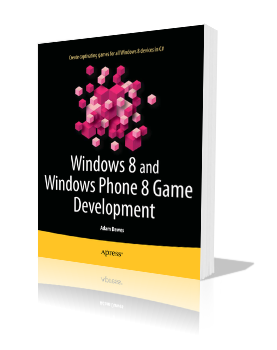 Adam Dawes, a regular community member, has just announced that his new book, Windows 8 and Windows Phone 8 Game Development, is now available. It can be downloaded from Apress and will soon be available in book form from Amazon, within the next few days. How to setup your development environment for Windows 8 and Windows Phone 8 game programming. Immerse yourself in the powerful MonoGame game development product. Techniques for building rich interactive games in 2D and 3D. How to create your own 3D models and graphics. Allow users to control your games with touch screens, keyboards, gamepads, mice and accelerometers. Gain insight that will allow you to take full advantage of Windows 8 and Windows Phone 8’s gaming capabilities. How to distribute games to your end users.